Politics 15 member Khashoggi hit squad: Who are they? Diplomacy Erdoğan to Saudis: Where is Khashoggi's body? "We gave the recordings, we gave them to Saudi Arabia, we gave them to Washington, to the Germans, to the French, to the English. They all know since they all listened to the conversations and everything," he said in a televised speech. "The 15 people who came to Istanbul [from Saudi Arabia], who are also among 18 detained by Saudi authorities, surely know who killed Jamal Khashoggi and where his body is. Saudi Arabia could resolve this by making this 15 talk," Erdoğan said. "The murderers are surely among this 15 or 18, there's no need to look elsewhere." Erdoğan also criticized the stance of Saudi authorities. "Saudi attorney general arrived in Turkey to dodge the column," he said, referring to the visit of Saudi Arabia's top prosecutor Saud al-Mujeb to obtain information about the case and his meeting with Istanbul Chief Public Prosecutor Irfan Fidan, who is leading the investigation. "He [Al-Mujeb] asks for our prosecutor down there. Here [Turkey] is the place where the incident took place, you can discuss whatever you want to discuss here." 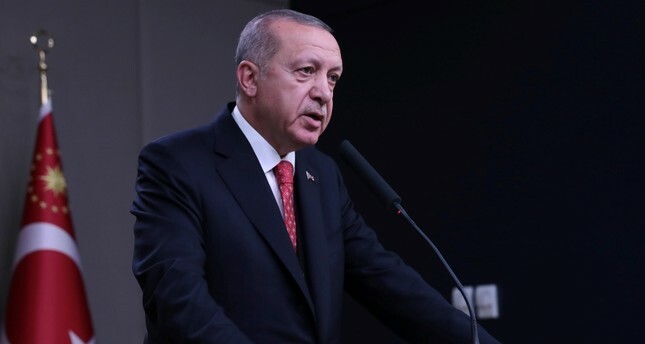 Erdoğan also called on Saudi officials to do their part to reveal the unanswered parts of the dissident journalist's murder. "Now Saudi Arabia should rid themselves of this stain by acting just against our goodwill," he said. Khashoggi, a Washington Post columnist critical of the Saudi government and its de facto ruler Crown Prince Mohammed bin Salman, went missing on Oct. 2 after entering the consulate to obtain documents for marriage procedures. After initially denying and later playing down the incident as a fistfight, Saudi Arabia accepted that the journalist's killing was premeditated and he died in an unplanned "rogue operation." Meanwhile, French President Emmanuel Macron and his U.S. counterpart Donald Trump agree that more details needed from Saudi Arabia on journalist Khashoggi's death, Reuters reported Saturday citing French presidency sources. Macron and Trump were meeting in Paris to discuss security issues and bilateral ties on the sidelines of WWI commemorative ceremonies. "When we go to Paris, we will try to secure an opportunity and we will realize a bilateral meeting," Erdoğan said ahead of his departure.